Don’t miss out on this amazing deal for your dream custom property. Imagine owning this property in the city of Tacoma for less than the cost of a used car. Build your dream home, or a second home, or a downsized home for retirement. Or buy the land, build a house and sell it for a profit. Maybe subdivide the lot and build a couple of properties? The possibilities are endless. This property is surrounded by single family homes and other properties valued from low $200k to over $400k. All of the shopping and dining amenities you could ask for are just a short drive away. 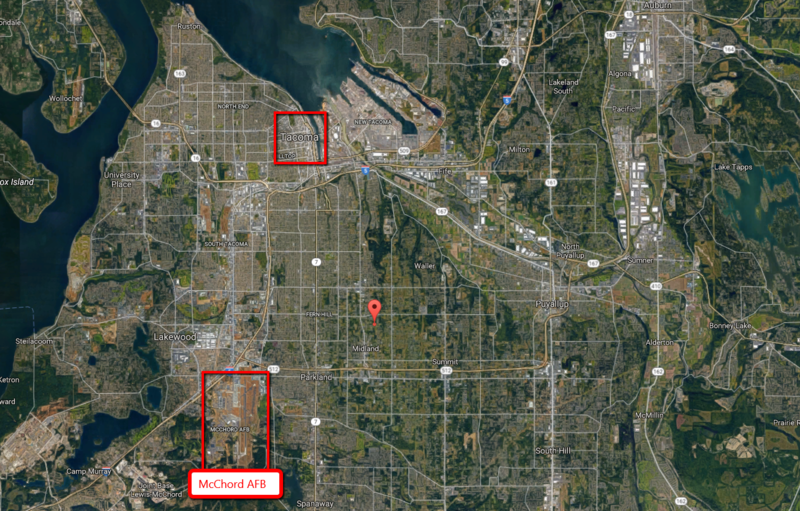 Located just 7 miles south of Tacoma, WA and 5 miles northeast of McChord AFB. If you love the outdoors, then you’ll also be only 52 miles from Mt. Rainier National Park, Click Here for more info. Similar properties in the area are listed for well over $50K. This nearby property just sold for $85k, but it’s only .46 AC: 9114 E E St.
Pierce County is one of the fastest growing counties in the US. It is the second most populous county in Washington behind King County (Seattle). The largest city in Pierce County is Tacoma. It was named for US President Franklin Pierce. Pierce County is notable for being home to Mount Rainier, the tallest mountain and a volcano in the Cascade Region. Pierce County is also home to McChord AFB, also known as Joint Base Lewis-McChord. ECONOMY – The unemployment rate in Tacoma is 6.9% (U.S. avg. is 5.20%). Recent job growth is Positive. Tacoma jobs have Increased by 2.48 percent. COST OF LIVING – Compared to the rest of the country, Tacoma’s cost of living is 12.90% Higher than the U.S. average. POPULATION – As of 2014, Tacoma’s population is 207,948. Since 2000, it has had a population growth of 17.71 percent. TRANSPORTATION – Average Commute time is 26 minutes. The National Average is 26 minutes. REAL ESTATE – The median home cost in Tacoma is $225,700. Home appreciation the last 10 years has been -3.85%. SCHOOLS – Tacoma public schools spend $12,309/student. The average school expenditure in the U.S. is $12,383. There are about 18.6 students per teacher in Tacoma. Tacoma’s Housing Market: It’s a good time to buy in Tacoma. Home appreciation is up 8.7% in the last 12 months. Much more information about Tacoma, WA can be found on its Wikipedia page by Clicking Here. These prices are before the monthly service charges. These fees will be an additional $30/month for loan servicing and liability insurance, 1/12 of the yearly tax bill per month (approx. $12). The total due today reflects the down payment as well as a one time closing/recording fee of $500 due upon agreement acceptance, as well as a 2 month reserve for taxes and liability insurance. You may pay off the property at any time with no pre-payment penalty. This is a classified listing please contact Matt Walker, by email at matt seaportassets.com.